Wyn Ericson displays his winning design for a new California license plate that honors the state park system. (0) CommentsCalifornia drivers will soon have the option of purchasing a new license plate featuring the state’s majestic redwoods, and they’ll have Wyn Ericson of Napa to thank for the design. 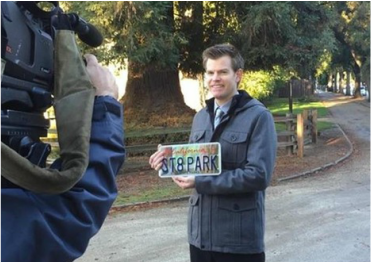 Ericson, a local artist and art teacher at River School, won a statewide contest held by the California Department of Parks and Recreation to develop a specialty license plate that will be available through the Department of Motor Vehicles. Money from sales of the new plates will go toward restoring and preserving California parks. The cost is $50, or $98 for a personalized plate. Ericson will not receive any money from winning the contest. But that doesn’t mean the experience hasn’t been rewarding for him. “What I’m getting is the satisfaction that I’m helping the parks,” said Ericson, who has received a “crazy amount of support” and acknowledgement from friends and family when they heard the news. Although he was surprised and taken aback by winning, his wife wasn’t. “It’s shocking to him, but it’s not that surprising when you consider how hard he works at everything and how good of an artist he actually is,” said Chelsea Ericson, who grew up in west Napa’s Browns Valley area. His wife is delighted by the attention being given to her husband, who aspires someday to devote all of his time to being an artist. His work has been shown locally at stores and restaurants, and examples can be found on his website, Wynericson.com. “I hope this is the beginning of something beyond” what he is doing now, though he considers himself very lucky already, Chelsea Ericson said. In addition to teaching art to sixth, seventh and eighth graders at the charter middle school, not to mention helping his wife raise their two young children, Ericson is working on his naturalist paintings —w hich he calls his “barns and farms” creations. The fact that his professional life centers on art and teaching is no surprise considering his family background. “I was born into a family of artists,” said Ericson, who grew up in Orange County and relocated to Napa Valley last decade, teaching first at St. Helena High School and middle school before moving to River School about five years ago. His father is an artist and taught middle schoolers for 20 years. His aunts and a grandmother also were teachers or artists. The response to his winning the contest has been “overwhelming,” he says, not only from relatives and friends, but also his school’s principal, Celeste Akiu, who is planning a special assembly that will be attended by state parks officials to honor his winning artwork. ruling on “fair dismissal” law. bilingual instruction classes for English Learners. money to fund K-14 education. rights of all union employees. click here to go to Napa Valley Register article! collaboration, critical thinking and creativity. Nick Cheranich- Romeo, Romeo....where fore art thou?????? I'm here at Silverado!! !